PurePro K100 system is a modern kitchen appliance that has been carefully designed with health consciousness, efficiency, high performance and convenience in mind. K100 uses K-Series inline filters which has molded quick-connect fittings that are easy to insert and remove the tube. PurePro K100 system uses reverse osmosis (RO) technology - which is recognized as the most effective at significantly reducing a large number of contaminants that may be in your water - no other home water treatment system offers you as much protection and reliability. 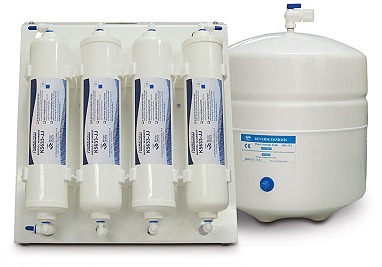 A very compact solution that efficiently combines reverse osmosis (RO) technology with K-series inline cartridge filters to produce high quality pure water. PurePro K100 system is available to be installed the booster pump for low water pressure needs.